Myostatin (Mstn) and growth/differentiation factor 11 (Gdf11) are highly related transforming growth factor β (TGFβ) family members that play important roles in regulating embryonic development and adult tissue homeostasis. Despite their high degree of sequence identity, targeted mutations in these genes result in non-overlapping phenotypes affecting distinct biological processes. Loss of Mstn in mice causes a doubling of skeletal muscle mass while loss of Gdf11 in mice causes dramatic anterior homeotic transformations of the axial skeleton, kidney agenesis, and an increase in progenitor cell number in several tissues. In order to investigate the possible functional redundancy of myostatin and Gdf11, we analyzed the effect of eliminating the functions of both of these signaling molecules. We show that Mstn-/- Gdf11-/- mice have more extensive homeotic transformations of the axial skeleton than Gdf11-/- mice in addition to skeletal defects not seen in single mutants such as extra forelimbs. We also show that deletion of Gdf11 specifically in skeletal muscle in either Mstn+/+ or Mstn-/- mice does not affect muscle size, fiber number, or fiber type. These results provide evidence that myostatin and Gdf11 have redundant functions in regulating skeletal patterning in mice but most likely not in regulating muscle size. Myostatin (Mstn) and growth/differentiation factor 11 (Gdf11) are highly related members of the transforming growth factor β (TGFβ) superfamily of secreted growth and differentiation factors. Like other TGFβ family members, myostatin and Gdf11 precursor proteins are proteolytically processed to form biologically-active carboxy-terminal dimers. Myostatin and Gdf11 share 90% amino acid identity in this carboxy-terminal region which places them in their own TGFβ family subgroup. They also have similar signaling pathways; both bind the activin type IIB receptor (Acvr2b, also known as ActRIIB) and activate the intracellular mediator Smad 2/3 pathway [1–5], and both are antagonized by follistatin, a secreted glycoprotein that can bind several TGFβ family members [2, 6–9]. Mstn is predominantly expressed in developing and adult skeletal muscle . We previously reported the disruption of the Mstn gene by gene targeting in mice and showed that myostatin normally functions as a negative regulator of skeletal muscle mass . Most Mstn-/- muscles are approximately double the mass of Mstn+/+ muscles due to both hyperplasia and hypertrophy of myofibers . Subsequently, naturally occurring Mstn gene mutations were found in cattle, dogs, sheep, and one child with increased muscle mass indicating conservation of myostatin function in mammals . Injection of myostatin antagonists also causes a significant increase in muscle mass in normal and dystrophic adult mice demonstrating that myostatin function is not restricted to developmental stages [12–17]. These results suggest that inhibition of myostatin may be a promising therapeutic target for treating muscle wasting diseases. We also reported the deletion of the Gdf11 gene by gene targeting in mice . In contrast to Mstn-/- mice, Gdf11-/- mice display anterior homeotic transformations of the axial skeleton wherein the identity of posterior vertebrae are transformed into those of more anterior vertebrae . Anterior/posterior (A/P) axial mesoderm identity is thought to be established by differential combinatorial expression of Hox genes that are induced as cells move through the primitive streak during gastrulation . Consistent with this model, Gdf11 is strongly expressed in the primitive streak and tail bud [7, 18, 20], and Gdf11-/- mice have altered Hox gene expression along the A/P axis . In addition to the axial skeleton, defects in Gdf11-/- mice are found in other tissues where Gdf11 is expressed. For instance, Gdf11-/- mice have renal agenesis, an increase in the number of islet progenitors in the pancreas, an increase in the number of neurons and neuronal progenitors in the olfactory epithelium, and an increase in the number of retinal ganglion cells and reduction in the number of photoreceptors and amacrine cells in the retina [21–25]. Although the phenotypes caused by each gene disruption appear to be non-overlapping, the high sequence identity and similarity in signaling mechanisms suggest the two factors may be functionally redundant. In addition, Mstn is expressed transiently in the primitive streak in the chick . We therefore decided to test whether myostatin has a role in determining A/P positional identity of the axial skeleton. In a similar vein, Gdf11 has been shown to inhibit myogenesis in chick limb mensenchyme cultures , so we also sought to test whether Gdf11 has a role in regulating skeletal muscle mass. Our data show that myostatin and Gdf11 have redundant functions in regulating skeletal patterning in mice but most likely not in regulating muscle size. We crossed double heterozygous mice (Mstn+/- Gdf11+/-) to produce Mstn-/- Gdf11-/- mice to examine redundancy of myostatin and Gdf11 function during development. Mstn-/- Gdf11-/- mice were born at the expected ratio (data not shown), but none were found alive. While most Gdf11-/- mutants have renal agenesis and cleft palate , these phenotypes were fully penetrant in Mstn-/- Gdf11-/- mice. To analyze skeletal alterations in double mutants, we performed skeleton preps on newborn mice to determine vertebral identity. Wild-type mice commonly have 13 thoracic and 6 lumbar vertebrae while Gdf11-/- mice typically have 18 thoracic and 8 lumbar vertebrae . Gdf11-/- offspring from crosses of double heterozygotes had 17–19 thoracic and 7–9 lumbar vertebrae as expected (Tables 1 and 2, Figure 1A). In contrast, skeletons of Mstn-/- mice had a similar pattern as the majority of wild-type mice with 13 thoracic and 6 lumbar vertebrae (Tables 1 and 2). Deletion of one allele of Mstn in Gdf11-/- mice (Mstn+/- Gdf11-/-) also had no effect on thoracic or lumbar vertebral number in comparison with Gdf11-/- mice (Tables 1 and 2). Loss of both alleles of Mstn in Gdf11-/- mice, however, resulted in a much more severe phenotype. Most Mstn-/- Gdf11-/- mice had 20 rather than 18 thoracic vertebrae although in 4 out of 17 double mutant pups the transformations were even more dramatic (Figure 1B, Table 1). In these 4 mice, the most posterior thoracic vertebra was asymmetric with a 21st rib on one side and a lumbar-like phenotype on the other (Table 1 and 2). The extent of the anterior homeotic transformations in the thoracic region of Mstn-/- Gdf11-/- mice were greater than any we have seen in Gdf11-/- mice. 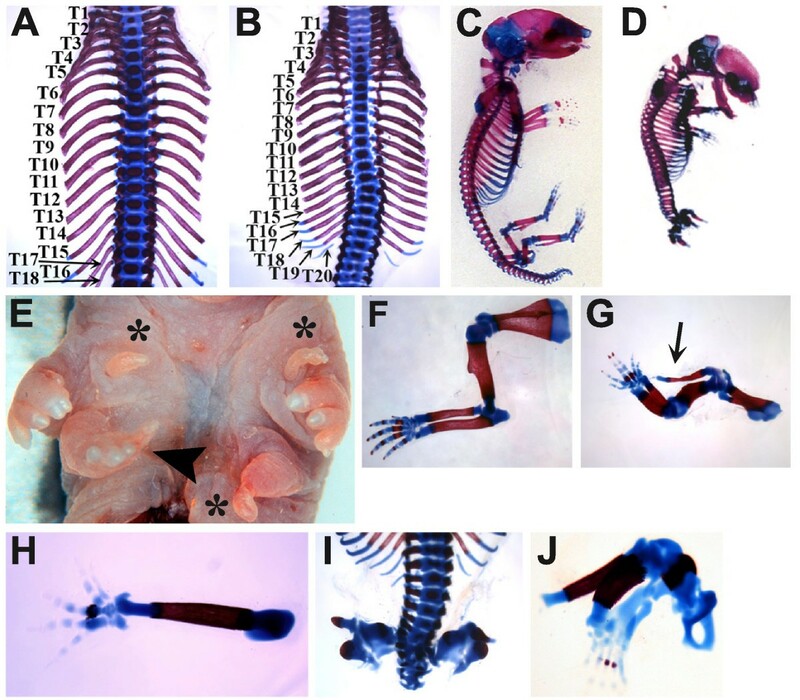 Skeletal defects in Mstn -/- Gdf11 -/- newborn mice. Thoracic region of Gdf11-/- (A) and Mstn-/- Gdf11-/- (B) mutants showing the increase in rib number. Note that the anterior homeotic transformations of thoracic vertebrae are more extensive in the Mstn-/- Gdf11-/- mutant (20 ribs) versus the single Gdf11-/-mutant (18 ribs). Whole skeleton preparation of Gdf11-/- (C) and Mstn-/- Gdf11-/- (D) pups. (E) Ventral torso of newborn double mutant showing multiple projections from the skin (*) and an extra limb (arrowhead). Forelimb skeleton preparations of Gdf11-/- (F) and Mstn-/- Gdf11-/- (G and H) pups showing an extra bone emanating from the shoulder of the double mutant (G, arrow) and an extra limb (H). The limb in (G) has been rotated for a better view of the extra bone. (I and J) Hindlimb phenotypes of Mstn-/- Gdf11-/- pups. Note the truncation of the vertebral column (I) and malformation of the ilieum and all leg bones (J). Numbers of mice displaying a given number of vertebrae are shown. Some mice have left-right asymmetry of the most posterior thoracic vertebra with a rib on one side and a lumbar phenotype on the other. These are designated by a + sign between 2 numbers indicating the number of ribs for each side. Numbers of mice displaying a given number of vertebrae are shown. Some mice have left-right asymmetry of the most posterior lumbar vertebra with a lumbar phenotype on one side and a sacral phenotype the other. These are designated by a + sign between 2 numbers indicating the number of vertebrae possessing a lumbar appearance for each side. Asymmetric vertebrae with a thoracic and lumbar phenotype were counted as thoracic (Table 1). Number of lumbar vertebrae could not be determined for Mstn-/- Gdf11-/- mice. The skeletal regions posterior to the thoracic region were also altered in mutant mice. As previously described , the sacral vertebrae were present in Gdf11-/- mice, but the axis was truncated in the caudal region resulting in an overall decrease in the number of vertebral segments and the loss of most of the tail with only a few deformed vertebrae remaining (Figure 1C). In Mstn-/- Gdf11-/- mice, there were even fewer post-thoracic vertebrae with an average of 10 post-thoracic segments, the most posterior of which were malformed (Figure 1D and 1I). The sacral vertebrae were not identifiable in Mstn-/- Gdf11-/- mice making it difficult to tell which vertebra was the most posterior lumbar vertebra (Figure 1I). The increase in severity of the Gdf11 null phenotype throughout the vertebral axis in the absence of Mstn demonstrates that myostatin and Gdf11 play redundant roles in patterning and development of the axial skeleton. Mstn-/- Gdf11-/- pups also had other skeletal defects not seen in Gdf11-/- mutants. The frontal bones curved anteriorly to meet the nasal bone which gave the skull vault a rounded shape compared to Gdf11-/- mice (Figure 1C and 1D and Additional file 1A and 1B: Cranial and forelimb digit skeletal defects in Mstn-/- Gdf11-/- newborn mice). Although Gdf11 is expressed in the developing limb buds [7, 20], no defects were detected in limbs of Gdf11-/- mutants (Figure 1C and 1F). Mstn-/- Gdf11-/- mice, however, had severe limb defects. Many Mstn-/- Gdf11-/- mice had small projections emanating from the skin on the ventral surface of the torso, some of which were filled with a single rod of cartilage (Figure 1E). In Mstn-/- Gdf11-/- mutants, the long bones of the forelimb were shortened relative to those in Gdf11-/- mice and, in 9 out of 18 double mutants, an extra bone projected from shoulder (Figure 1F and 1G). The most surprising result was a third limb that resembled a forelimb composed of a single unidentifiable long bone with attached digits (Figure 1E and 1H). This phenotype was found in 6 out of 18 double mutants, two of which also had an extra bone on the contralateral shoulder. In all Mstn-/- Gdf11-/- mutants, the forelimbs in the normal position displayed digital patterning defects including a sixth digit, which appeared to be similar to digit V, and syndactyly of digits III and IV consistent with the expression of Gdf11 in the interdigital region where programmed cell death would normally occur [7, 20] (Figure 1G and Additional file 1C and 1D: Cranial and forelimb digit skeletal defects in Mstn-/- Gdf11-/- newborn mice). No other genotypes displayed any of these limb defects. The hindlimbs in Mstn-/- Gdf11-/- mice displayed very different malformations than the forelimbs. The hindlimbs were small and deformed although what appeared to be elements of both proximal and distal structures, pelvic bones, long bones, and digits, were seen in most double mutants (Figure 1D, I and 1J). These results suggest some proximal/distal patterning was maintained despite inhibition of hindlimb bud outgrowth. This is the first demonstration that myostatin and Gdf11 are both required for limb development and axial skeletal development and patterning. The effects of deletion of both factors on the axial skeleton was greater than for loss of Gdf11 alone most likely due to the transient expression of Mstn in the posterior primitive streak overlapping with Gdf11 expression . We presume that the extra limbs seen in the double mutant mice result from an expansion of the limb field, but clearly additional studies will be required to fully understand the molecular basis for the formation of the extra limb buds. We also sought to determine whether myostatin and Gdf11 are functionally redundant with respect to control of muscle mass. The increase in muscle mass in Mstn-/- mice is not present at birth (A.C.M. and S-J.L., unpublished observations) so the neonatal death of Gdf11-/- and Mstn-/- Gdf11-/- mice precludes a comparison of the skeletal muscle phenotype. We therefore generated a targeting construct containing a conditional deletion allele of the Gdf11 gene by inserting loxP recombination sites into intron 1 and flanking a neo gene downstream of the Gdf11 3' UTR (Gdf11flox-neo) (Figure 2A and 2B). Following homologous recombination in embryonic stem (ES) cells and injection of the targeted cells into blastocysts, we obtained chimeric mice that transmitted the Gdf11flox-neoallele through the germline. Mice carrying the Gdf11flox-neoallele were then crossed to EIIa-Cre transgenic mice to generate Gdf11flox/+ mice carrying one upstream and one downstream loxP site after removal of the neo gene. Recombination at the remaining loxP sites would be predicted to delete exons 2 and 3 (Gdf11Δ2–3), which would remove the biologically-active carboxy-terminal domain. To demonstrate that recombination of loxP sites produced a null allele, we generated germline recombination of loxP sites in Gdf11flox/+ mice (Gdf11Δ2–3/+). Skeletal analysis performed on offspring from Gdf11Δ2–3/+ matings showed that Gdf11Δ2–3/+ and Gdf11Δ2–3/Δ2–3 mice had 1 and 5 extra thoracic vertebrae, respectively (data not shown). These thoracic vertebral numbers are identical to that of Gdf11+/- and Gdf11-/- mice  confirming that recombination of loxP sites in the Gdf11 flox allele results in a null allele. Muscle-specific targeting of Gdf11 gene. (A) Representation of targeting strategy. The 3 exons are shown as boxes with coding sequences shaded black and the 3'UTR open. The targeting construct is represented by a thick line which contains loxP sequences with EcoRI restriction sites inserted into the second XbaI site in exon 1 and flanking a neo gene inserted into the EcoRI site downstream of the 3'UTR. Cre-mediated recombination of the loxP sites flanking the neo gene results in a Gdf11 flox allele. Recombination of the Gdf11 flox allele generates the Gdf11Δ2–3 allele. Oligonucleotide primers used for distinguishing alleles are labeled a, b, and c. A skeletal muscle-specific Cre expressing transgene was constructed using the MLC1 promoter/1/3 enhancer and an SV40 t antigen intron and poly adenylation signal. (B) Southern blot showing detection of Gdf11+, Gdf11 flox , and Gdf11-(null, from the original knockout line) alleles. (C) Northern blot analysis of MLC-Cre transgene expression in pectoralis and quadriceps muscles but not in other tissues. (D) Detection of Gdf11 alleles in genomic DNA in Gdf11flox/floxand Gdf11flox/floxMLC-Cre mice by PCR (right panel). Recombination was detected in quadriceps and pectoralis muscles of Gdf11flox/floxMLC-Cre mice but not in heart, brain, or kidney. No recombination was seen in Gdf11flox/floxmice. Left panel shows control reactions. (E) Northern blot analysis of skeletal muscle Gdf11 expression showing a strong decrease in expression in Gdf11flox/-MLC-Cre muscle compared to Gdf11flox/-muscle. For skeletal muscle-specific recombination of loxP sequences, a Cre deletor transgenic line was made using the myosin light chain 1/3 promoter/enhancer (MLC-Cre) (Figure 2A). As expected, Cre expression in this line was restricted to skeletal muscle (Figure 2C). MLC-Cre mice were crossed to Gdf11flox/+ mice and then backcrossed to Gdf11flox/+ mice or crossed to Gdf11+/- from the original knockout line. Recombination of Gdf11 flox was detected specifically in skeletal muscle genomic DNA (Figure 2D). In Gdf11flox/- muscle, Cre-mediated recombination resulted in a near complete reduction in skeletal muscle Gdf11 expression (Figure 2E). Body weight and muscle mass were measured in all 8 possible genotypes produced from crosses of Gdf11flox/+ MLC-Cre and Gdf11+/- mice. There were no differences in body weight or muscle mass between Gdf11+/+, Gdf11+/+ MLC-Cre, Gdf11+/-, Gdf11+/- MLC-Cre, Gdf11flox/+, or Gdf11flox/+ MLC-Cre mice demonstrating that there was no heterozygous or transgene phenotype (data not shown). We next performed an examination of the muscle phenotype of Gdf11flox/- and Gdf11flox/- MLC-Cre mice. There was no statistically significant difference in body weight or muscle mass between Gdf11flox/- and Gdf11flox/- MLC-Cre mice (data not shown and Figure 3A). Muscle weight, fiber number, and fiber type in skeletal muscle-specific Gdf11 mutant mice in a Mstn wild-type or null background. (A) Weight of pectoralis, triceps, quadriceps, gastrocnemius/plantaris, and tibialis anterior muscles (n = 7–12). (B) Number of total, IIA, IID/X, and IIB fibers in the EDL muscle (n = 3–4). EDL muscles had on average less than 4 type I fibers in all genotypes so type I data are not shown. 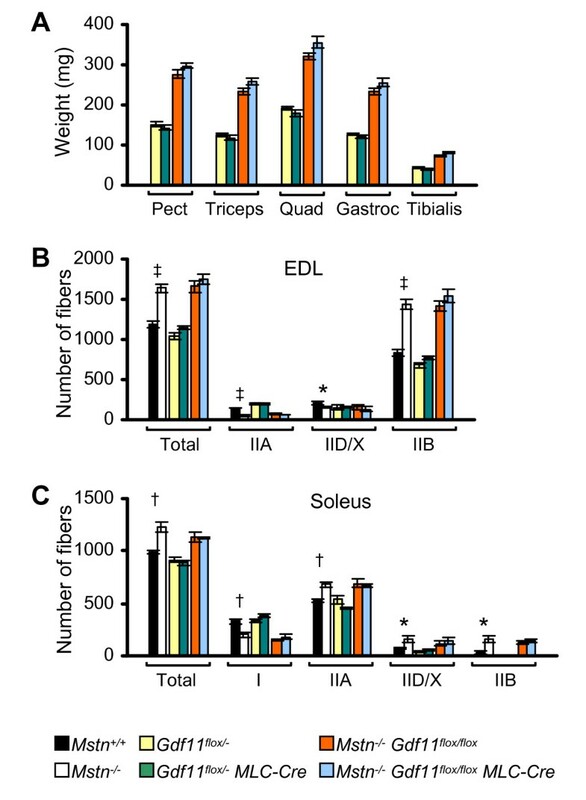 (C) Number of total, type I, IIA, IID/X, and IIB fibers in the soleus muscle (n = 3–5). Skeletal muscle-specific Gdf11 deletion had no effect on muscle mass, fiber number, or fiber type unlike Mstn deletion (*P < 0.05, †P < 0.01, ‡P < 0.001). Data are mean ± s.e. Skeletal muscles vary in their composition of fiber types which differ in metabolic and contractile properties . In mice, type I fibers are slow contracting and oxidative, type IIB fibers are fast contracting and glycolytic, and type IIA and IID/X fibers are intermediate in phenotype. Mstn-/- mice have an overall increase in the number of muscle fibers and alterations in the proportions of the different fiber types compared to Mstn+/+ mice resulting in a shift toward more glycolytic muscle [10, 29, 30]. To determine whether Gdf11 regulates fiber number or type, we counted the number of each of the four fiber types in Gdf11flox/- and Gdf11flox/- MLC-Cre mice from the widest part of each muscle. We chose a fast muscle, the extensor digitorum longus (EDL), and a slow muscle, the soleus, for analysis because they have been previously shown to have alterations in fiber number and type in Mstn-/- mice [29, 30]. Unlike muscle in Mstn-/- mice, there was no difference in the total number of fibers in either the EDL or the soleus muscles between Gdf11flox/- and Gdf11flox/- MLC-Cre mice (Figure 3B and 3C). Fiber type composition in Gdf11flox/- and Gdf11flox/- MLC-Cre mice was not significantly different either (Figure 3B and 3C). Because a role for myostatin in axial skeletal patterning was found only in the absence of Gdf11, we asked whether a phenotype caused by loss of Gdf11 in muscle might be present in the absence of myostatin. Mstn-/- Gdf11flox/floxmice were crossed to Mstn-/- Gdf11flox/floxMLC-Cre mice, and body weight and muscle mass were measured in offspring at 8 weeks and 6 months of age. There were no significant differences in body weight or muscle mass found between genotypes at either age (data not shown and Figure 3A). Next, we determined fiber number and fiber composition. There were no significant differences in the total number of fibers or in the number of individual fiber types in EDL or soleus between Mstn-/- Gdf11flox/floxand Mstn-/- Gdf11flox/floxMLC-Cre mice (Figure 3B and 3C). Our results provide evidence that that myostatin and Gdf11 have redundant functions in regulating skeletal development and patterning but not skeletal muscle size. We certainly cannot rule out the possibility that sufficient Gdf11 function is maintained by the small amount of Gdf11 expression remaining in the mutant muscles or that Gdf11 may have a function in developing skeletal muscle at early stages of development prior to activation of the MLC promoter. Gdf11 is detectable in serum  so we also cannot rule out the possibility that Gdf11 produced by other tissues not affected by muscle-specific recombination contributes to muscle mass regulation. Nevertheless, the lack of an effect of these genetic manipulations of Gdf11 signaling on muscle mass was somewhat unexpected because myostatin and Gdf11 are highly homologous and because the function of myostatin in regulating skeletal muscle mass is clearly redundant with that of other TGFβ family members. Injection of a soluble Acvr2b receptor causes a 20% increase in muscle mass in Mstn-/- mice demonstrating that at least one other ligand in addition to myostatin is a negative regulator of skeletal muscle size . This other Acvr2b-binding ligand(s) must also be inhibited by follistatin; Mstn-/- mice have double the muscle mass of Mstn+/+ mice while Mstn-/- mice overexpressing a muscle-specific follistatin transgene have quadruple the skeletal muscle mass of Mstn+/+ mice . Several other TGFβ superfamily members are potential candidates for myostatin functional redundancy. In addition to Gdf11, other family members, such as the activins and some bone morphogenetic proteins, bind Acvr2b and follistatin [31, 33–36]. Myostatin, Gdf11, activin, and some BMPs can be isolated from serum using Acvr2b affinity purification . The affinity of the BMPs for follistatin, however, is considerably lower than that of activin, myostatin, and Gdf11 [8, 9]. Additionally, the activins inhibit differentiation of C2C12 myoblasts and skeletal muscle precursors in the chick limb and would therefore be likely candidates for functional redundancy with myostatin [31, 37]. It is also possible there are multiple TGFβ family members that are negative regulators of muscle mass in addition to myostatin that individually have only small effects on muscle growth. If so, deletion or inhibition of these factors might cause a measurable increase in muscle mass only in the absence of myostatin and other redundant ligands. Not only are the ligands redundant, myostatin and Gdf11 receptor function is also redundant. Although the affinity of myostatin for activin type II receptor (Acvr2, also known as ActRIIA) is low [2, 5], Acvr2-/- mice, like Acvr2b-/- mice, have a small increase in skeletal muscle mass relative to Mstn-/- mice . This suggests that both Acvr2 and Acvr2b are receptors for myostatin in vivo. Similarly, Acvr2b-/- mice have anterior homeotic transformations of the axial skeleton that are milder than those seen in Gdf11-/- mice . The Acvr2+/- Acvr2b-/- axial skeletal pattern closely phenocopies that of Gdf11-/- mice  suggesting that both Acvr2 and Acvr2b are receptors for Gdf11. These data suggest therapeutic strategies that target both Acvr2 and Acvr2b receptor function or myostatin and other TGFβ growth factors with similar functions would lead to greater increases in muscle mass than targeting either Acvr2b or myostatin alone. Our results demonstrate that myostatin and Gdf11 have redundant functions in regulating skeletal patterning in mice. We did not, however, find evidence that Gdf11 is the TGFβ family member that is redundant to myostatin in regulation of skeletal muscle size. To determine the therapeutic strategy that results in the greatest potential increase in muscle mass, it will be important to identify the other TGFβ family members that negatively regulate skeletal muscle mass. Total RNA was isolated from 8 week old animals from a pool of pectoralis, quadriceps, triceps, gastrocnemius, plantaris, and tibialis anterior muscles using Trizol reagent (Invitrogen). PolyA+ RNA was isolated from total RNA using an Oligotex mRNA kit (Qiagen). For Northern blot analysis, 5 μg mRNA was electrophoresed, blotted to GeneScreen Plus (Perkin Elmer), and hybridized according to the manufacturer's instructions using a probe corresponding to the carboxy-terminal region of Gdf11 in exon 3. After the signal decayed, the same blot was probed with Gapdh as a loading control. All animal experiments were approved by the Institutional Animal Care and Use Committees of the Johns Hopkins University School of Medicine or NIDDK. To make muscle-specific Cre expressing mice, the coding sequence of Cre recombinase modified to contain Kozak consensus sites was inserted into the MDAF2 vector containing the myosin light chain promoter and 1/3 enhancer and SV40 processing sites . To make the Gdf11 conditional allele, 3 loxP sites were inserted in intron 1 and flanking a neo gene downstream of the 3' UTR (Figure 2A) and used to replace the endogenous locus by gene targeting in ES cells. Microinjections and blastocyst injections were carried out by the Johns Hopkins School of Medicine Transgenic Core Facility. Offspring of male Gdf11flox-neo/+ chimeras mated to C57BL/6 females were crossed to EIIa-Cre transgenic mice in the FVB background (The Jackson Laboratory) to generate males mosaic for loxP recombinations . These males were mated to C57BL/6 females and screened by PCR for loss of the neo gene and retention of Gdf11 exons 2 and 3 (Gdf11flox/+). Gdf11flox/+ mice were crossed once more to C57BL/6 mice, and EIIA-Cre negative Gdf11flox/+ mice were crossed to MLC-Cre mice to generate Gdf11flox/+ MLC-Cre mice. Gdf11flox/+ MLC-Cre mice were mated to Gdf11+/- in a 129/Sv genetic background from the original knockout line and to Mstn+/- in the C57BL/6 genetic background. Gdf11flox/+Mstn+/- MLC-Cre mice were crossed to Gdf11flox/+Mstn+/- mice to generate Mstn-/- Gdf11flox/floxand Mstn-/- Gdf11flox/floxMLC-Cre mice which were interbred to produce animals for analysis. To show that Gdf11Δ2–3 is a null allele, Gdf11Δ2–3/+ mice with germline recombination of the Gdf11 flox allele were obtained using Cre/Esr1 mice  purchased from The Jackson Laboratory. ES cell targeting and F1 offspring were analyzed by Southern blot after EcoRI digestion of genomic DNAs using the same probe as in ref. 18. EcoRI fragment sizes were 6.5 kb for wild-type and 2.5 kb targeted Gdf11 flox-neo alleles. 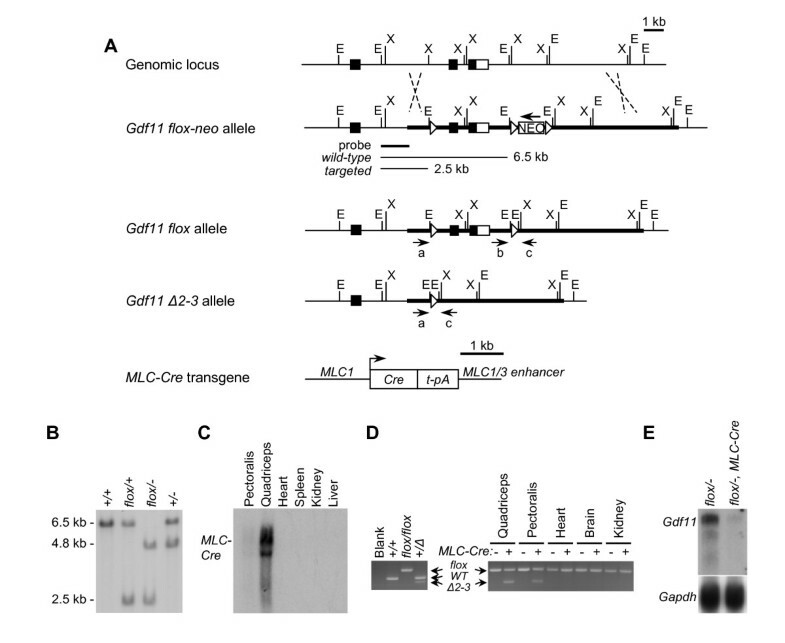 Loss of the neo cassette after crosses to EIIA-Cre mice was determined by PCR using primers b and c. Gdf11 flox , Gdf11Δ2–3, and Gdf11+ alleles were detected by PCR using one reaction containing primers a, b, and c. Cre lines and Mstn alleles in crosses between Mstn+/- and Gdf11flox/+ mice were genotyped by PCR. All PCR was carried out at an annealing temperature of 55°C in buffer containing 10 mM Tris, pH 8.8, 25 mM KCl, 1.5 mM MgCl2, 0.2 mM of each dNTP, and 0.8 μM of each oligonucleotide primer. Oligonucleotide primers used and product sizes: Cre, 505 bp, 5' CCGAAATTGCCAGGATCAGGG 3' (forward) and 5' TCGCCATCTTCCAGCAGGCGC 3' (reverse); Mstn+, 220 bp, 5'-AGAAGTCAAGGTGACAGACACAC-3' (forward) and 5'-GGTGCACAAGATGAGTATGCGG-3' (reverse); Mstn null (in PGK neo cassette), 332 bp, 5'-GGATCGGCCATTGAACAAGATG-3' (forward) and 5'-GAGCAAGGTGAGATGACAGGAG-3' (reverse); Gdf11 alleles, Gdf11 flox a/c = 300 bp, Gdf11+ b/c = 359 bp, Gdf11Δ2–3 b/c = 393 bp, (a) 5'ATGCAGATGGTAATACTTGGG3', (b) 5'-AAGGCTTGGGAAGCAGGCAAG-3', and (c) 5'-AGGTATGGTTAGGGTGTGGAG-3'. Gdf11 alleles were genotyped by Southern blot for crosses between the Gdf11 null allele from the original knockout line and Gdf11flox/+ MLC-Cre. Genotyping of offspring from Mstn+/- Gdf11+/- crosses were performed by Southern blot as described [10, 18]. Soleus and EDL muscles from 8 week old (Gdf11flox/-, Gdf11flox/- MLC-Cre, Gdf11flox/flox, and Gdf11flox/floxMLC-Cre) or 13 week old (Mstn+/+ and Mstn-/-) mice were frozen and 12 μm cryostat sections were taken as described . Fibers were counted from the widest part of the muscle belly from H/E (soleus) or trichrome (EDL) stained sections. Fiber typing was done on adjacent sections. Primary antibodies were used as dilutions of supernatants from hybridoma cell lines (American Type Culture Collection) and detected with the M.O.M. Peroxidase Kit (Vector Laboratories). Cell lines, dilutions, and fiber types detected were as follows: BA-D5, 1:30, type I; SC-71, 1:5, type IIA; BF-F3, 1:1, type IIB; N2.261, 1:5 plus BF-F3, 1:1, unstained type IID/X. Skeletons of newborn mice were stained as described . Body weight and muscle weights for the eight different genotypes produced from crosses between Gdf11flox/+ MLC-Cre and Gdf11+/- mice were analyzed by single-factor ANOVA with genotype as the factor and were considered significant if P < 0.05. All other comparisons between two genotypes were analyzed by Student's t-test. Under a licensing agreement between MetaMorphix, Inc. (MMI) and the Johns Hopkins University, the authors are entitled to a share of royalty received by the University on sales of the factors described in this paper. We and the University own MMI stock, which is subject to certain restrictions under University policy. S-JL, who is the scientific founder of MMI, is a paid consultant to MMI and to Merck on research areas related to the study described in this paper. The terms of these arrangements are being managed by the University in accordance with its conflict of interest policies. We thank N. Brockoff and J. Portas for assistance in maintenance of mouse lines, B. Sauer for the Cre vector, S. Pearson-White for the MDAF2 vector, and the Johns Hopkins Transgenic Core Facility for carrying out the pronuclear and blastocyst injections. This work was supported by grants from the National Institutes of Health (R01HD35887 and U54AR052646, to S-J.L.) and the Intramural Research Program of the National Institute of Diabetes and Digestive and Kidney Diseases, National Institutes of Health, USA (A.C.M.). S-JL designed and produced the Gdf11 targeting construct. TVH constructed the MLC-Cre transgene and characterized the transgenic lines. ACM carried out ES cell targeting, performed all other experiments, and wrote the manuscript. All authors read and approved the final manuscript.